MS can cause a wide variety of symptoms, however most people with MS will experience only a few of these symptoms throughout the course of the disease. Some MS symptoms are more common than others, such as problems with vision, weakness or fatigue. Most symptoms of MS usually occur in a pattern of relapse followed by a period of remission. This means that people with MS may have some noticeable symptoms, such as weakness or trouble with their speech, after an MS attack. However, these symptoms may improve either completely or partially during remission, and different treatments are available to reduce or prevent symptom relapses. There are other symptoms of MS, such as fatigue and emotional changes, that can occur at any time during the course of this condition as well as during an MS attack. Being diagnosed with MS can be a very frightening time, as the symptoms of MS are unpredictable. Support is available from your MS Field Worker and a range of healthcare professionals to help you take control and manage your MS symptoms. 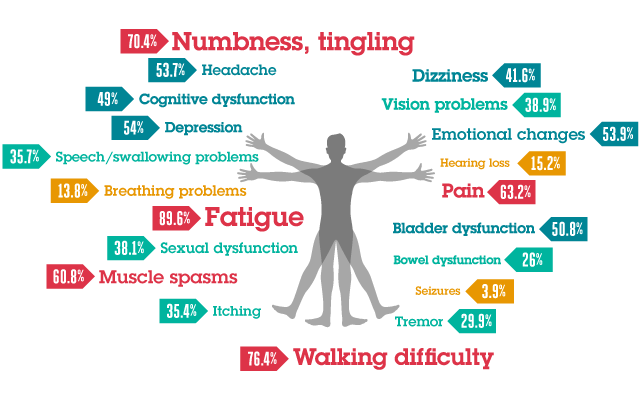 Balance and co-ordination problems are common in MS, but the effects and causes can be different from person to person. Some people can feel unstable on their feet, or they may find that they need to be more careful to avoid losing their balance. Problems with co-ordinating movements or grasping small objects can also make some activities more difficult. Vertigo is a balance problem that is less common in MS and consists of a feeling of dizziness where the world appears to be spinning. There can be other causes of balance and co-ordination problems apart from MS, and balance problems are also common in the general population. Problems with balance can be successfully managed, although there is no single solution that will suit everyone. People who find effective ways to improve their balance generally feel more confident about getting out of the house and staying active. Bladder problems are common in the general population and can also be a symptom of MS. Perhaps as many as three quarters of people with MS experience bladder urgency, incontinence or urinary retention at some time during the course of the condition. Many people with MS will never experience bowel problems, but symptoms such as constipation or incontinence can occur. Bladder and bowel problems can generally be effectively managed with specialist care and practical solutions, while sometimes drug treatment or catheterisation may be appropriate. Fatigue is one of the most common symptoms experienced by people with MS and it is often the symptom that has the most impact. People with MS fatigue describe it as an overwhelming feeling of lack of energy that, unlike tiredness, is not improved by rest. It may increase with heat and can temporarily worsen other symptoms such as balance or vision. Concentration and mood may also be affected during periods of fatigue. Balancing the activities of daily life can become an issue with limited reserves of energy. Often called the ‘invisible’ symptom, fatigue can have both a physical and mental impact. It can influence all kinds of activities, from going to work, socialising with friends, keeping up with housework or playing with children. Seeking advice from healthcare professionals such as your MS Nurse can make all the difference, as treatment or symptom management guidance is available. Helping friends and family to understand the impact of this symptom can also help during times of fatigue. Memory and concentration difficulties are common in the general population during older age and can also occur in people with MS. It is common for people with MS to experience mild problems in recalling information or concentrating on tasks. However, there are a number of other possible causes of these types of cognitive changes, so seeking professional advice is appropriate. Memory and concentration changes can be worrying and create stress or pressure at work and at home. People can often feel very frightened about what is happening to them, and other people may misinterpret these symptoms if they do not understand that it can be part of having MS. Healthcare professionals such as your MS Field Worker or an Occupational Therapist can provide information about the cause of these symptoms and suggest specific coping strategies that can help with even mild problems. MS can affect your mood and emotions as well as your body. While there are many common emotional reactions to having MS, such as fear, anger, sadness or denial, there are also some emotional changes that can occur as a consequence of MS disease activity or as a side-effect of drug treatment. Depression is a common symptom of MS that can affect anyone at any stage of disease, even people who have been coping well. Medication and talking therapies are proven to be effective in helping people with MS to treat and manage this symptom. Any changes in mood or emotions that are persistent and causing you concern should be discussed with your GP or Neurologist. Also known as spasticity, muscle spasms or stiffness are common symptoms of MS, affecting at least 20 per cent of people at some time. These changes affect people differently. Some may find that mild muscle stiffness can aid balance and mobility, while more severe stiffness or spasms can restrict mobility and be tiring, frustrating and painful. There are a number of treatments available and health care professionals can help you to find the right treatment or management approach for your symptoms. Physiotherapists may be able to provide a plan of appropriate stretching exercises and activities for maintaining or improving mobility. Other treatments such massage and acupuncture may also be beneficial. Some people with MS may experience pain as a direct result of MS symptoms such as neuralgia or as a secondary effect of symptoms such as spasms. However, these symptoms are not isolated to MS and may be caused by other factors. Pain in MS is different from person to person. It may be infrequent or a daily occurrence. Ongoing pain is greatly distressing for anyone, but it is also easily treatable in most cases, so it is extremely important to seek advice from a healthcare professional if you experience pain or discomfort. MS can sometimes cause problems with speech or with swallowing. These symptoms usually occur when people have had MS for some time, although they can also happen temporarily during periods of fatigue. Problems with speech and swallowing can be managed with help from a Speech and Language Therapist (SLT). Your GP will be able to refer you to an SLT to discuss specific management strategies to suit you. For many people one of the early symptoms of MS is a problem with vision, such as temporary visual loss, blurring or double vision. These types of visual disturbances can be called optic neuritis. Most people who experience these symptoms recover their vision completely, however a small number of people may have ongoing problems with their eyesight as part of a relapse or on a more permanent basis. Problems with vision are common in the general population and can be caused by a number of different factors. If you develop problems with your vision, whether you have MS or not, it is important to seek advice from your GP or other qualified medical specialist. Muscle weakness and poor muscle co-ordination are symptoms that are most often associated with MS. Weakness in muscles of the lower limbs is frequently experienced as an early symptom of MS that may affect walking and balance. Other muscles may also be involved, such as in the hands, arms or torso. For some people this symptom improves, but for others there may be continued weakness that reduces mobility and some fine motor activities. Physiotherapy and strengthening exercises can help with this symptom, and can help to prevent problems associated with muscle deterioration due to inactivity. If you have muscle weakness as well as spasms, it is important that you consult a health professional such as a physiotherapist who can design an appropriate exercise programme for your needs. Regular activities such as Riding for the Disabled also provide an enjoyable way of exercising and strengthening muscles for people with MS.